Yes, our baby twins turn 5 next Monday and it is a long weekend here in Western Australia! The big party with their school friends is being held at the Fun Factory today at Mandurah around midday, so much excitement everywhere! 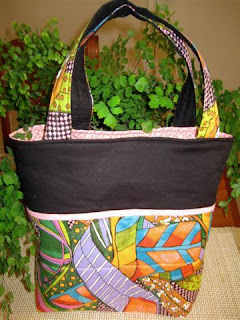 The Happy Bag above was a rushed project on Friday - turned out quite nicely - more about that later! Thank you all very much for the opinions on Tyler's quilt - yes, it is going to be his - so my mind is made up, thank goodness! I'll add a couple of more borders and the golf ball fabric will be the backing - then into the quilting queue! 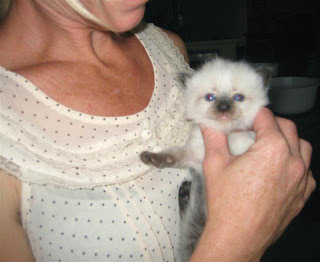 Looks like this little girl might become a family member - a ragdoll kitten, just 4 weeks old! Isn't she just the cutest? Another 4 weeks and looks like the baby twins will have a new playmate! If anyone likes to give advice on ragdolls, I would be happy to hear it - we haven't had one in the family before! My DH is going with DD's family up to Seabird for the weekend - a lovely little cray-fishing village quite a way north of here - lucky me - I will be able to read until all hours of the night - am really looking forward to it! 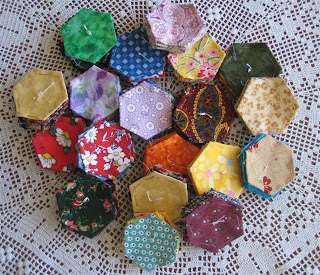 Oh, the blue hexagons above - all together ready to be stuffed - hopefully another pin-cushion idea - will continue playing tonight! This what has happened to Tyler's quilt so far - maybe not to be, though I am happy with it! Perhaps not blokey enough for an 18 year old - though Tyler is not blokey - just gorgeous, so what do you think? I don't usually use 'homespun' type fabrics - though, this black border fabric is Emma Louise - just gorgeous and about the best quality I have ever seen in Australia in latter years. I love, love the wonky cabins and could add extra borders to make it larger for Tyler - but, then I think - maybe leave it as it is and let it be a Comfort Quilt? It is 54" square, so a reasonable size as is - maybe a funky young teenage girl would like it! Should I add the extra borders and make it up to say 64"? Have another very important project calling, so must away and stop dithering about this quilt! 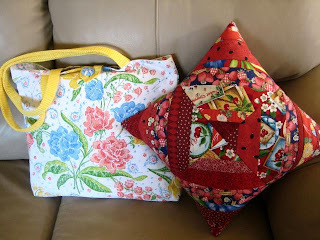 Raggy Quilt Edge and Bric-a-brac! 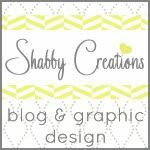 Just a little bit of chit-chat about how I finish my Raggy Quilt Edges if I don't bind them! See above - I use a triple strength stitch and sew around the edge twice - that gives 6 rows of stitching - secure forever! Hope this shows - I clip roughly about 1/4" apart and the batting goes right to the edge - this time I used flanellete and I'm happy with the result! Oh, by the way - I just can't say enough about my Fiskars snippers - these are the best - as I've said mine are the little more expensive ones with the titanium blades! At first wash and tumble dry - yes - there is quite a bit of lint in the washing machine and the dryer filter - wow - lots! This quilt has had two washes and drys and I am sure it's next housemaid won't have a problem! I do have a friend who made her quilt out of used denim jeans - too heavy and 'karked' the washing machine - maybe leave denim alone, Girls! 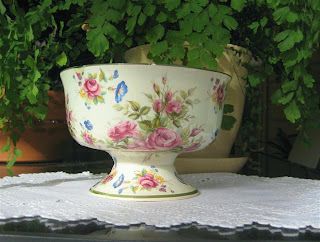 The above is a pic of a gorgeous antique bowl Mum bought for me at Mount Tamborine in the hinterland of Queensland's glorious Gold Coast - a nicer place on earth you couldn't find - but then I say that about a lot of places! Not inexpensive and all it says on the bottom is 'H. Bequet Fait main..Hand made Handwerk Made in Belgium' - maybe we paid a little more than we should have - who knows - still a very pretty piece of bric-a-brac that I don't display these days anyhow! I should be out with Girlfriends! - not to be - so I will try to muster up enough energy to get something done! A weekend of accomplishment - even with not feel too chirpy and with interruptions! I happily snipped away last night with my Fiskars snippers and managed to get the above finished, even washed and dried! Very late night - so a little sleep-in this morning. 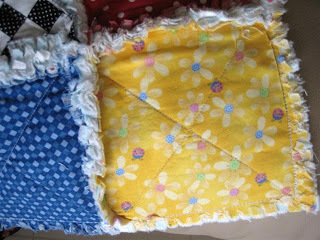 I'm feeling happy with the quilt - very cuddly and I hope it brings a lot of comfort to some little child! 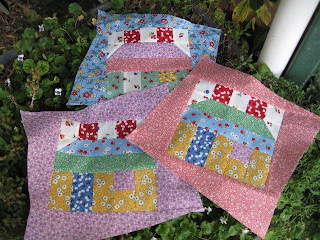 Just had to show you Peg's Happy Houses - oh, so pretty! and trimmed back as you can see! 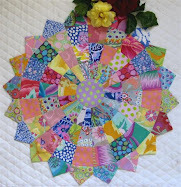 Peg comes from Happy in Quilting - oh, I guess a lot of you know that - hope she is happy with me showing off her houses! Also, many of you would have seen Julia's Happy Houses - Julia owns Julia's Place! It's not too late to join up to be in the swap - just click the button on my sidebar to see the tutorial - really quite easy and the girls are having a lot of fun. I am happy to receive the blocks by the end of April, and even though both Julia and Peg have trimmed theirs back to 10" - I will be happy to do that with yours! Unfortunately I have to keep it to Aussie girls only, though a couple of the OS girls do have friends here who are going to look after the postage bit for them, so that's great! Well, I'm off to the machine to finish off my wonky Log Cabins - a bit of a story there - hope to be able to show you the quilt top soon - then lots of machine quilting to do! By the way - I planned the perfect Prison Escape and am enjoying the freedom! Prison Escape - I Am Liberated Again! 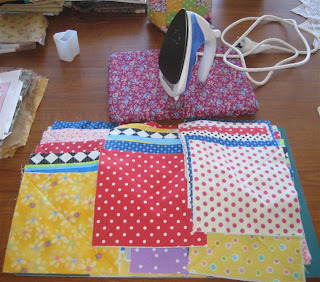 Talk about a severe mood swing - no, not really - but, how could one not feel bright and cheery quilting in this fashion - liberated! Not feeling quite as perky as usual and didn't feel like applying myself to anything this morning - thought perhaps I would just sit down and snip my raggy quilt - not at all like me to spend time through the day doing something like that! So it was washing, folding, shopping and a little sewing in between! Dinner is partly cooked, a little bit of computer time, tidy up strippy mess and relax with my snipping for the evening - to bed early and a little read of Nora Roberts 'Northern Lights' - very little daylight, lots of darkness and snow and a corpse found on a mountain! 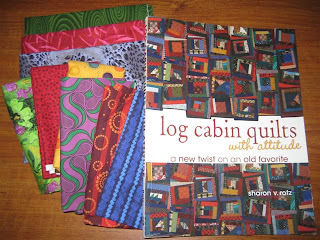 Above, my liberated Log Cabins - a quilt for Tyler (18)? - maybe not - I love playing with colour and do not find it easy to make sombre, blokey quilts! Heck of a lot of fun and easy-peasey it's going to be hard to go back to precision quilting! While I was sewing, my mind went back to a quilt I made for older, twin grandson now nearly 13. Christine, of Once Upon a Quilt ... will remember this, I think she helped me kick off with the wonky stars, then I pieced it in quilt-as-you-go method! I was certainly liberated then! Maybe you'll have to click to enlarge this to see my machine stippling/meandering - it was never good enough for me at that time -now I think 'gee, that wasn't so bad'. Must have a try again one day soon - unfortunately have lost quite a lot mobility in my left arm/shoulder since then - but, I'll try! 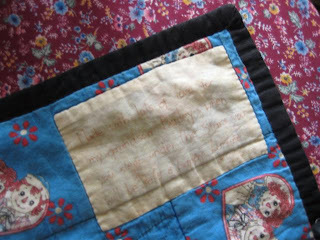 The label for this quilt tells me I made it in 2002 - not mentioning the mushy stuff a nanna writes to her grandson - I did write, 'Bailey - when you sleep under the stars, you will be safe and happy'! Another one is 'When you sleep under stars, you sleep under love'! Wouldn't this be a nice little thought to write on our starry, Comfort Quilts! There are so many being made at the moment. If you haven't seen Julia's at Julia's Place do pop over to pay a visit - you'll enjoy! My 'Happy House' builders have quite a bit to show and tell -great work, Girls - will tell folks in my next Post! 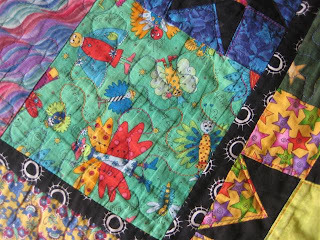 Off to try to relax for a little while before cleaning up quilting mess - why does quilting have to be this way! This week has flown by again - I'm looking forward to a weekend sewing, so here's hoping. Oooh, look what I have bought through the week - a gorgeous new book - I'm really spreading my wings and that's a good feeling. 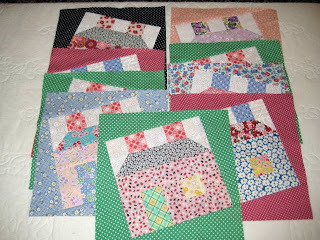 Grandson Tyler turns 18 on 26 March, needs a new cuddle quilt for winter, so hopefully I can put these gorgeous, wonky, log cabins into a quilt for him. I will make time to do a trial run over the weekend! Let's see if it is Liberation! I am starting a nice collection of novelty prints - I so envy the gorgeous ones seen on various blogs and really, I don't think there is a lot around over here! Very cutesy! On the right, a wonderful piece of fabric - I only bought 20cm at $40 a metre - about the texture of osnaburg and looks like it has been through the wash a 100 times - just love it, so vintagey! My priority this weekend is to try to make further headway on my Comfort quilts to warm our survivors - there's still a few scary incidents over that way, so prayers for safety continue! Again - wish me luck that I don't get too many interruptions over the weekend! Mmmm, this one was done quite a while ago (like many, many, years!) and is quite large - I love it so much, I made one for Mum, too! I really do enjoy crocheting, but have other preferences these days - as I have said before - plenty of time for that 'when I am and old lady' (lol)! So many thing I do feature dollies - just seems to be my way! The raggy quilt for Bushfire Relief is all prepared and waiting by my machine - hope to get some sewing done this morning. The softer pastels are underneath - just thought it all needed a bit of brighter contrast! 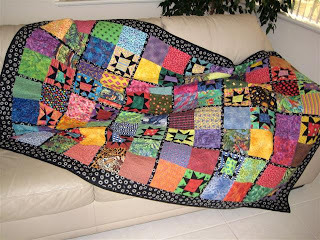 There is so much generosity going into everything quilty by so many Australian girls - it is quite amazing - so many fabrics and batting being donated and long-arm quilters offering their help. I am sure nobody in the ravaged areas will be cold this winter! At WAQA guild sewing day yesterday, our group, Girlfriends!, all got together and made up these little flower bundles of hexagons, all basted over papers, ready to be stitched - to be sent to stitchers who have lost everything in the fires - hopefully it will be a little therapy for those girls, just to sit and stitch, lost in their own little thoughts! A big welcome to three more Happy House Swappers, Lise, Pat and Melissa! Names and links are all listed on my sidebar - we have twenty now, so that is great - plenty of time to join up! PS - please pop over to visit Julia and Toni to see their Happy Houses! It's done! The Carolina Crossroads quilt top is ready for quilting - hopefully next weekend! Machine quilting is certainly not my forte, but this one is 53" square, a nice lap quilt size and should not be too much of an ordeal! 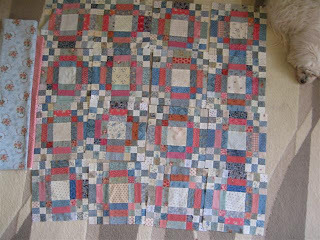 As I was piecing the blocks, I thought to myself 'Now, why didn't I put sashing between the blocks to make it bigger?' Anyhow, I quite like the secondary design it has formed with all the little one inch blocks! And the wide border fabric is quite pretty! They are all reproduction fabrics except the border - even a lovely double pink Judie Rothermal for the pink narrow border! 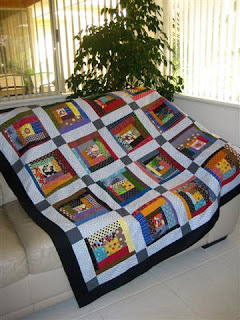 This is going to be another raggy quilt - I will donate it to the bushfire victims, too! I bought the flanelette for the batting layer - 'they say' it makes up beautifully in raggy quilts and very inexpensive, too! 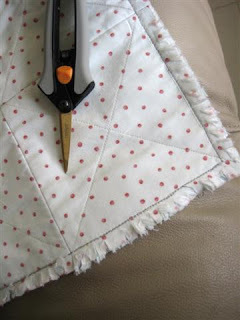 I have mislaid my gorgeous Fiskars snippers, probably amongst the mess on my sewing table - must find them, they are mandatory to complete all the snipping for this quilt! I choose not to call these charity quilts - to me they are comfort quilts and I really do hope they bring warmth and comfort to people! Please check the two buttons on my sidebar referring to other nice things that are happening in the quilting world for the bushfire victims! A Challenge for This Weekend! Should I spend the day doing a big, tidy-up of my sewing room? I don't think I will! I have discovered these blocks left over? from Bonnie's Mystery Quilt, Carolina Crossroads. Since taking this pic, I have found a better piece of border fabric, too. So I am going to make a top for the bushfire victims. 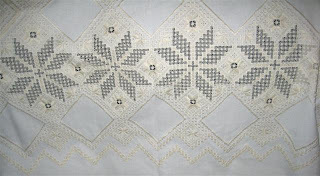 It is cold at night in Victoria already, so let's hope I can get this done and maybe get it quilted next weekend! Oopsy! Didn't really want to talk about these girls first, but can't move them - oh well, here we go! Now there are 12 - just roughly thrown on the floor for the pic - no they are not wonky! Mmmm, not sure - maybe I should have left it at 9! I was going to think about sashings and border today - maybe I should think about it for a day or two! Yesterday I did a PS on a project Tia of Campfollower Bags and Quilts has started - Tia was the receiver of one of my Dolly Quilt Swaps - gorgeous girl from the US who is posted here in Alice Springs with her military husband. 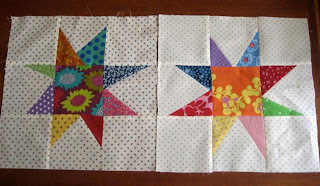 Now, Tia has asked for these Happy Star blocks to be made and donated, so she can piece and quilt them for bushfire victims - a very generous gesture! She is asking for only 2 blocks and they were designed by Bonnie Hunter and Tia has her permission to use them. They are larger blocks than Bonnie's - 12 1/2" - I made these 2 yesterday and just started with 4 1/2" blocks - works out perfectly! Do pop over and visit Tia's blog if you feel like helping out! After all these years, at last I am staying at my sewing machine and pressing as I go - find I still tend to stand up at times! I have always liked running back and forth to the ironing board for exercise. 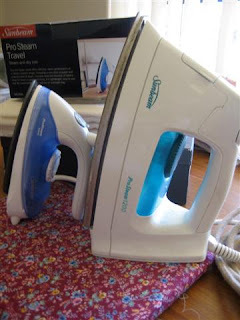 Now I have bought a gorgeous little Sunbeam travelling iron and yes, it steams, too - I'm sold on it! Look how small it is compared to my standard Sunbeam! 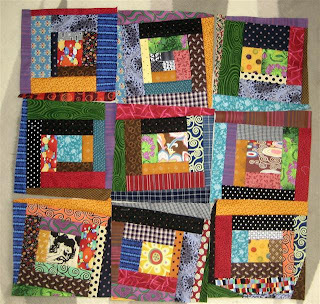 I have left-over blocks from Carolina Crossroads ( another of Bonnie's Mystery Quilts!) 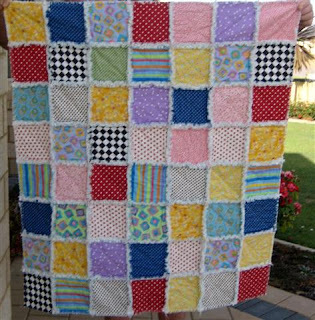 - maybe there is enough to make a nice quilt for one of our bushfire victims - oh, the heartache seems like it will never go away! Happy stitching dear friends - hugs! Yesterday, Julia and I travelled to join up with our Girlfriends! at Louise's place - a lovely day, thanks Louise, and nice to see your new house,too! It was nice to have a bit of fun and cheeky conversations in times that are so gloomy for Australia! We send each other up a lot and this makes for a lot of laughter - also, we do solve a lot of the world's problems with more serious discusson from time to time! Louise's dear friend, Nancy joined us and brought along her beautiful needlework for all to enjoy! I took quite a few pics and today I'm showing you the very gentle pieces! 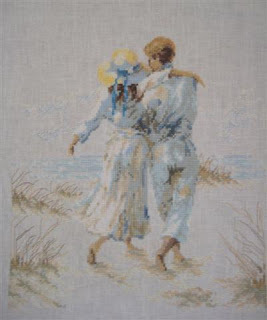 The cross-stitch is so fine and delicate, stitched on 32-count linen! 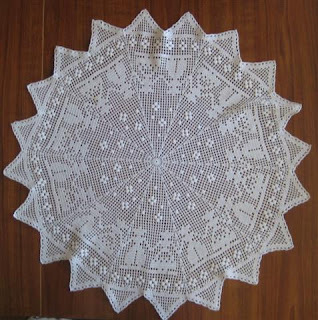 Very beautiful hardanger - twelve months work so far and more to do as you can see - it will be a true masterpiece! Happy House Swappers are still coming in - this is really great - another four to add to the list when I have finished this Post. Sheila has asked if it is possible for her niece, The Faeri Queen -in England to join and Sheila will take care of the postage - a wonderful idea! Welcome to you both and also to Narelle an Tracey! Must make today a constructive one - though it is going to be very hot! 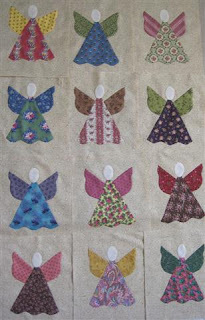 I need to think about sashing and borders for my angels, so may pop out! Prayers and thoughts will be carried in my heart for all those hit by our tragedy! 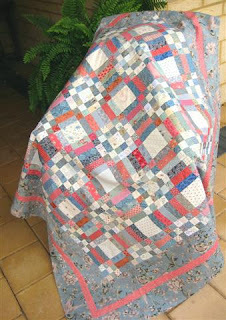 PS - Aussie Girls - please visit Tia of Campfollwer Bags and Quilts and join in her Bushfire Quilt Project! Tia has generously offered to assemble and quilt blocks we donate! 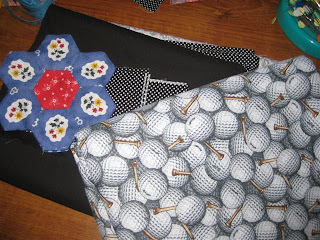 Also, Peg of Happy in Quilting has made a wonderful appeal - do follow developments there, also if you'd like to help! I really don't feel good about posting at the moment - the reason - our state of Victoria is in the grip of the worst bushfires ever! Breaking News is continually being broadcast on the tele and many lives are believed to have been lost - little children, too! I'm sorry to talk about sadness and tragedy - I try to keep my posts bright, cheery and uplifting, but 'Black Sunday' news is overwhelming - thoughts and prayers are with you all over there and blessings to our courageous firefighters! 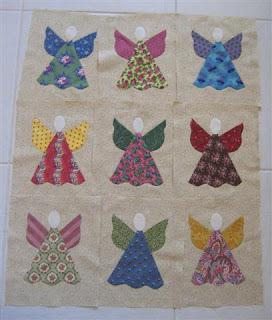 Last night I happily stitched Angels, 7, 8 and 9 - is this enough for a wallhanging with sashings and borders? - is the little one in the brown dress standing out too much? I have set myself a goal to finish the top of this by the end of the month - seems realistic - I just have to decide whether to do more or not! 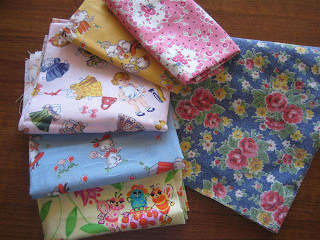 I have used reproduction fabrics and have some more lovely ones to use - maybe I will carry on! PS - Whoopee - see the list on my sidbar - we now have 12 House Swappers - would love to see more - just click the button! If you have a chance do pop over to wish her Happy Birthday - I know a lot of her Followers follow my blog, too and she is a wonderful person! Mein Liebling - My Darling! 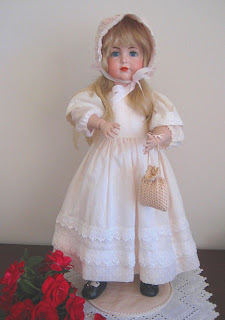 For many years I did porcelain doll-making - I truly loved it! It is an expensive and time-consuming art, but oh, the passion one can put into transforming greenware into a beautiful doll to treasure forever! 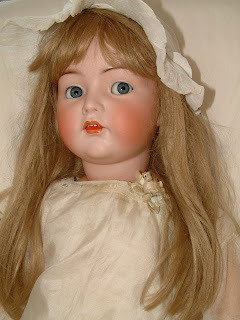 My favourites were the antique dolls and this one below was the original Mein Liebling, a beautiful German doll, Circa 1910. Notice how she doesn't have eyedots, i.e. little red dots at the inner corner of her eyes! 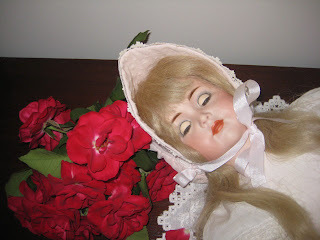 Below is my reproduction, a great treasure of mine, and I am sure she will stay in our family forever! I did not cut her mouth out and put in teeth! I did give her sleep-eyes - beautiful blue glass eyes! What a beautiful child-like face - it is hard to describe the feelings and emotions one puts into creating a face like this! I really miss my painting these days and will show you more in the future! Here she is sleeping - so beautiful! Sleep-eyes require a lot of patience and skill to achieve! 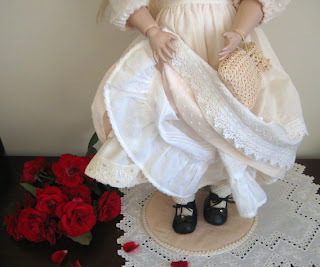 Most antique dolls had at least two petticoats, all hand made and crocheted and embroidered! 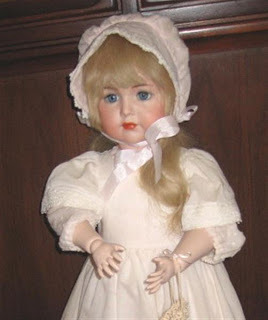 Guess I will put her back in my dolly cabinet where she lives! Mein Liebling has won many awards for me, and missed out on being The Best of Show once, because she didn't have painted eye-dots - did the original? How lucky can one person be in one week! 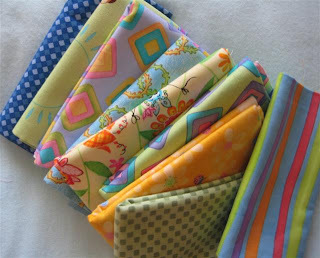 Just look at the beautiful Giveaway I was lucky enough to receive from Darlene of Quilting Daze! 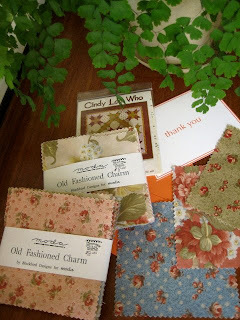 Thank you so much, Darlene - two gorgeous packs of Moda Charm Squares and a little pattern - I still can't believe what a wonderful world Blogland is! Me - and I think I am very lucky! Teresa of Diddle Daddle Designs had a giveaway recently and I was one of the lucky winners to choose two items from her Etsy Shop! Here they are all the way from the USA! I felt a bit embarrassed about picking two items and chose the great tote/shopper in the first instance. Teresa got back to me and asked me to pick anothery - so I chose the gorgeous, bright pillow - the fabrics in both items are stunning! Thanks you so much, Teresa - the items are just gorgeous and your workmanship is so very neat - a truly wonderful giveaway to receive!